There is no denying that the beautiful outdoor or landscape of any residential or commercial property adds to the appeal of the property as well as its resale value. 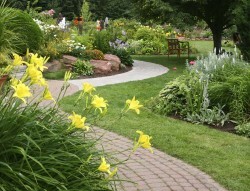 Lawns and gardens enhance the comfort level of the residents and enable people to make the most of it. They need proper and periodic care and maintenance, which, although a strenuous and time consuming task,is worth every penny, considering the value and importance of your investment in your property. Buyers look for properties with beautiful outdoors. Homes with poor landscapes sell 8-10% below equivalent homes with good landscapes. Professional landscaping can not only add as much as 15% to the resale value of a building but also speed up the sale by as many as 6 weeks. A single mature tree can absorb 48 lbs of Carbon Dioxide ayear, nearly equivalent to the amount of emissions from a car driven for11,000 miles. Thus, trees in your lawn act as the best pollution filters that will purify air. Lawns provide the best cooling effect that keeps the temperature of your home exteriors low and comfortable. The front lawns of just eight houses provide the cooling effect of 70 tons of air conditioning that is enough to cool 20-25 homes. Using professional landscaping and garden service and planting selected trees can cut energy costs as much as 25%.Planting shrubs and perennials in your lawn or garden lowers the temperature and keep your home indoors cool thereby reducing energy needs. Garden activities such as planting, watering or weeding for 45 minutesburns off as many calories as 30 minutes of aerobics. You can burn 300 calories in one hour of weeding. Besides the above, you are more likely to get 7 to 10 times of your initial investment in returns in form of your produce. The edibles that you will grow in your garden will save that much money you may incur buying the same stuff from the market. You can’t even get such an attractive rate of return in your savings account. You will get a sustainable and healthy supply of fresh fruits and vegetables from your garden. This will giveyou priceless health benefits. It can be safely said that your lawn and garden and its effective care and maintenance will bring you immense value and maximum returns on investment. You will save your hard earned money, and will get fresh and pure air together with healthy homegrown produce. Feel free to visit us online at www.bestyard.com for more information and services.